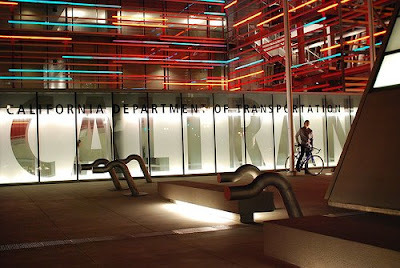 Bike to Work Day is an annual event sponsored by the Metro and designed to promote cycling as an option for commuting to work. Bike to Work Day, as celebrated in Los Angeles, is intended to encourage neophyte cyclists by drawing them into the cycling community and rewarding them with gifts and encouragement. 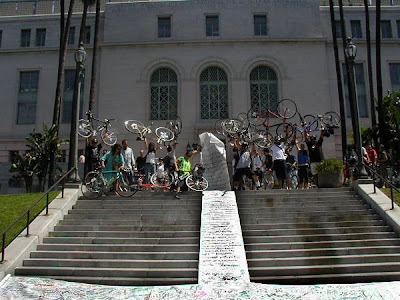 For the 2nd year in a row the large number of cyclists who spent the entire day riding their bikes around LA served to demonstrate that in addition to getting more people on the bike, LA needs more work for those cyclists. 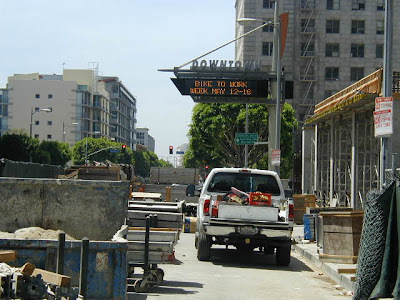 As large employers served up early morning snacks to their hardy bike commuters and then hustled them into their cubicles, the Bike Instead of Work crew milled about the Hollywood & Western Metro Station munching on bagels and watching the world wake up. 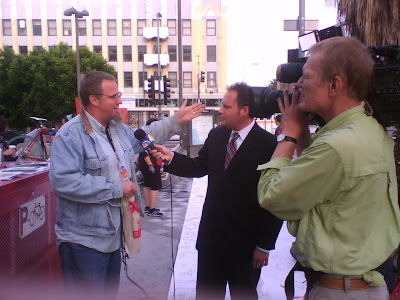 The day started at 5am for Stephen and Enci as they met up with John Cádiz Klemack of NBC 4 for a couple of hours of "look what's happening on the streets of Hollywood" interviews. John and his crew hung out and gave the Cyclists' Bill of Rights a bit of attention. Chris Kelly of Hollywood Pro Bikes provided bagels and bike tune-ups, a regular feature at his shop. (not the tune-ups, the bagels!) 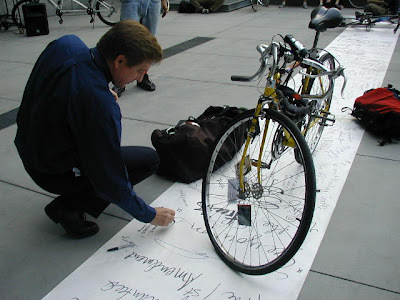 The tricksters in the crowd performed skids, trackstands and rode countless circles in reverse while the activists extolled the virtues of the Cyclists' Bill of Rights, quickly filling a 50 feet scroll with signatures of support. Through it all, the growing crowd howled at the cyclists who rode by "One of us! One of us!" Cyclists who dared to stop for the swag bag and a bagel were challenged by the employment-impaired to "Ride with Us!" and "Bike Instead of Work!" Cyclists came from the four corners with the San Fernando Valley represented along with San Pedro, NELA and the Inland Empire. Some came from other rides and had been up all night, some came from Brass Knuckles' slumber party and some were there for their first group ride. Mitch O'Farrell and Helen Leung from City Council President Eric Garcetti's office (also on the corner of H'wood & Western) joined us and took a few moments to address the herd and sign the Cyclists' Bill of Rights. As Mitch and Helen left to go run the city, the Bike Instead of Work crew slowly mounted up and rolled down Hollywood Blvd. picking up a few more cyclists as they headed through Silver Lake and Echo Park. SiteLA had coffee and tamales on the sidewalk and Randy passed the hat, raising $100 for her ALC Aids ride campaign. Fortified and energized and ready to "not work" the group headed off to City Hall. The route went down Sunset Boulevard and onto Park and then through the 2nd Street Tunnel, which was filled with the howls and whistles of cyclists who are most used to group rides that take place during the late night hours. The streets contained light traffic and the typical response was a light "toot toot" which was accepted as a wee bit of bike love. The south lawn of City Hall was full with a Farmer's Market and the cyclists took three or four laps around the block to fully announce their presence to the Farmer's Market crowd. The Bill of Rights was unfurled on the steps of City Hall. 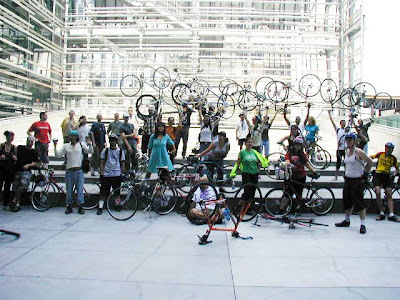 Mayor Antonio Villaraigosa did NOT show up to acknowledge the fact that the cyclists of Los Angeles are taking a leadership position in transportation solutions and that the Bike Instead of Work cyclists were taking a leadership position in having fun. 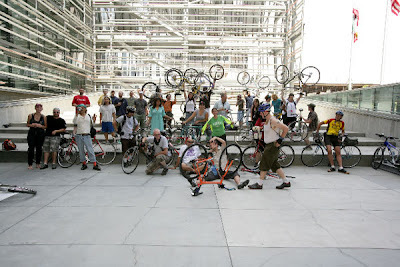 A few howls at the waning moon, a few jeers at the Mayor for failing to support Bike Instead of Work Day and the steps were occupied for the traditional "Bike Lift" and the cyclists were off...all the way across the street to the Caltrans building. Numbering about 50 at this point, cyclists rode the ramp onto the Eli Broad Plaza, the Thomas Mayne designed "public space" that fronts 100 Main, and the fun began. As Annie, Mikey, and Stephen rode in reverse circles, security rushed to the Plaza and an announcement was made instructing the cyclists to walk their bikes. The irony of the request was lost on those who were obviously not used to seeing the Plaza filled with cyclists and who were distressed to see the open space filled with humanity and expressions of bike skills. Traffic Jam, a band made up of Caltrans employees was setting up for a lunch time performance and Dale Benson and Keith Sellers were hosting a Bike to Work pit stop under "Motordom," the largest public art installation in the City of Los Angeles. As the band played Queen's "Bicycle" MikeyWally led the crowd in singing "I want to walk my bicycle!" 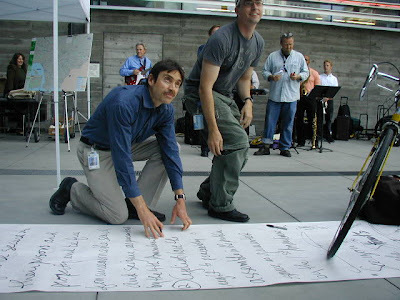 By now the Cyclists' Bill of Rights was unfurled and Caltrans Deputy District Director Jim Hammer took the mic to give the cyclists some bike love and then he joined Dale and Keith in signing the Bill of Rights. Caltrans Chief Deputy Raja Mitwasi missed out on the speechifying but he joined the crowd and made a point of introducing himself and reminding the cyclists of Caltrans' commitment to alternative transportation, especially cycling. With high noon approaching, Phillipe's called and the Bike Instead of Work ride broke up into the French Dip & Beer crowd and the Los Angeles Neighborhood Initiative crowd. The LANI cyclists rode off to USC for a free lunch and a panel discussion on cycling in Los Angeles featuring Lynne Goldsmith of the Metro and Erik Knutzen of Homegrown Evolution who gave an inspired call to action. Change the World? Ride your Bike! Nuff said! Down to a dozen, fed and watered, loaded down with swag and feeling the sun, the group headed back to Hollywood, losing Urban Hippie and Rhombeo along the way who used their library cards to take advantage of some free time in the USC swimming pool. Urban Hippie recounts her day complete with cannonballs at USC and celebratory libations in Echo Park. It was a great day, way long and full of bike love. It was great to make new friends, see old friends and to celebrate Bike Day, part of Bike Week, in Bike Month, all of which is part of BIKE LIFE.